This week we have more straight reporting from Studio Dave with a look at some conference activity, cool developments in the world of Ardour and news about some new and updated programs for your complete Linux music production studio. The Linux Audio Conference for 2009 was held in Parma, Italy, from April 15 through April 19. Alas, I was unable to attend, but the organizers again provided video and audio streams for us stay-at-homes. 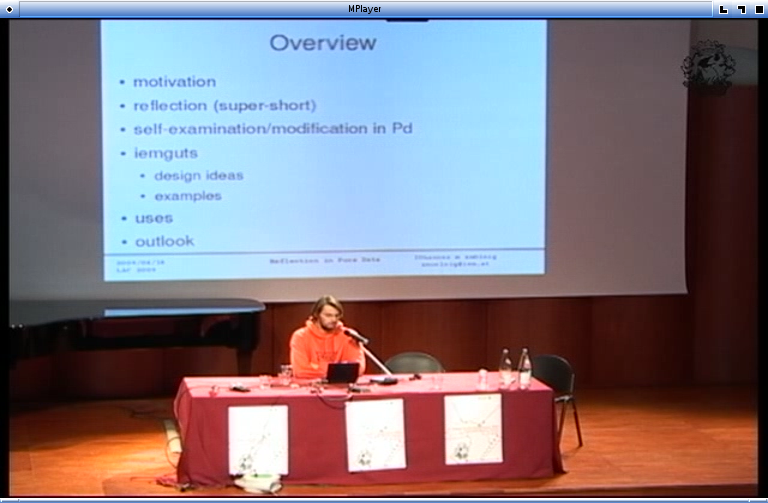 Video recordings and PDF files of the slide shows are already available at http://lad.linuxaudio.org/events/2009_cdm/. Incidentally, the video quality is superb (Figure 1)—a testament to the advances in the Vorbis Project's Theora video codec. Major thanks to Jörn Nettingsmeier and his crew for their splendid work to capture the presentations in such excellent quality streams and files. This conference is a key "meeting of the minds" for Linux audio developers and users. Represented projects included Csound, the Q programming language, Pure Data (Pd), netjack and many others. Former conferences have been characterized by an abundance of fine conversation, music, food and wine, and reports indicate that organizer Fons Adriaensen maintained the tradition in excellent style. Judging from the quality of the papers I've read and the videos I've watched, LAC2009 appears to have been another successful event. As far as I know, the date and location of LAC2010 have not been formally announced, although Utrecht has been mentioned as a likely candidate. Paul Nasca is widely known for his superb ZynAddSubFX, a very deep and popular softsynth (it runs on Linux and Windows). He also is known for his unique PaulStretch (Figure 2), now available in version 2.0. PaulStretch can be used for normal time compression/expansion, but it has been designed especially for extreme application. 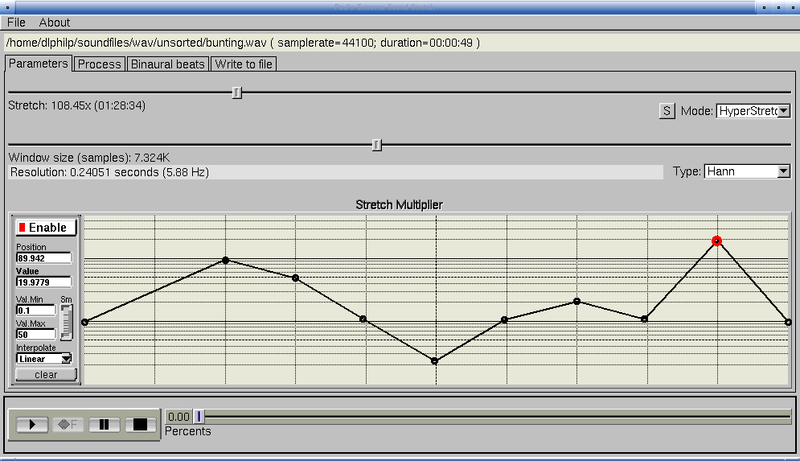 For example, when I processed a 49-second soundfile with the HyperStretch function, the default output length was almost 1 hour 30 minutes. Obviously time expansion of this duration is meant for experimental purposes, and the results can be very surprising. Incidentally, the maximum stretch for my little test file was 1,553 years and 284 days. If more time is needed, perhaps you should contact the developer. Tomasz Mon has announced his gdigi (Figure 3), an editor for the Digitech RP250/RP500 guitar processor pedals. gdigi intends to provide the editing capabilities found in Digitech's X-Edit software, and the author invites requests for more supported devices. In other guitar-oriented news, Hermann Meyer has updated his wonderful guitarix to 0.04.1-1 (Figure 4). The new version includes some major bug fixes and introduces a new Oscilloscope view for those of us who can't get enough visual feedback. The modern digital audio workstation (DAW) deals not only with audio and MIDI, but also is expected to provide some degree of support for video display and edition. Developer Robin Gareus has produced a couple such programs, including his well-known xjadeo, a video display window with JACK syncronization capability. 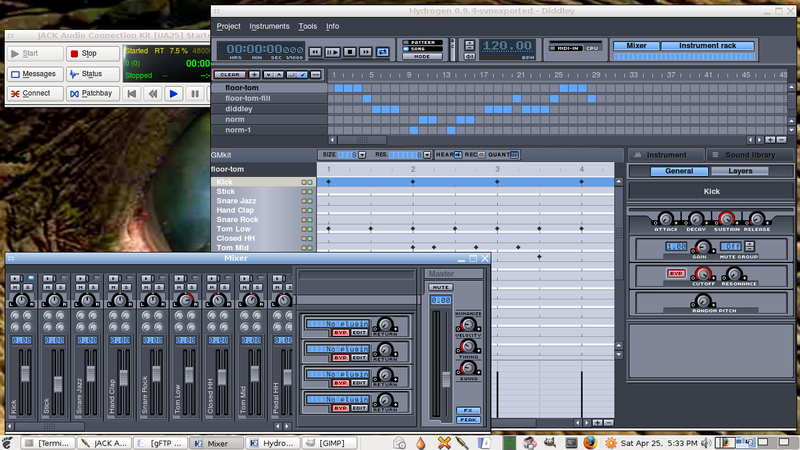 xjadeo works beautifully with Ardour, but, alas, it provides no timeline within Ardour itself. 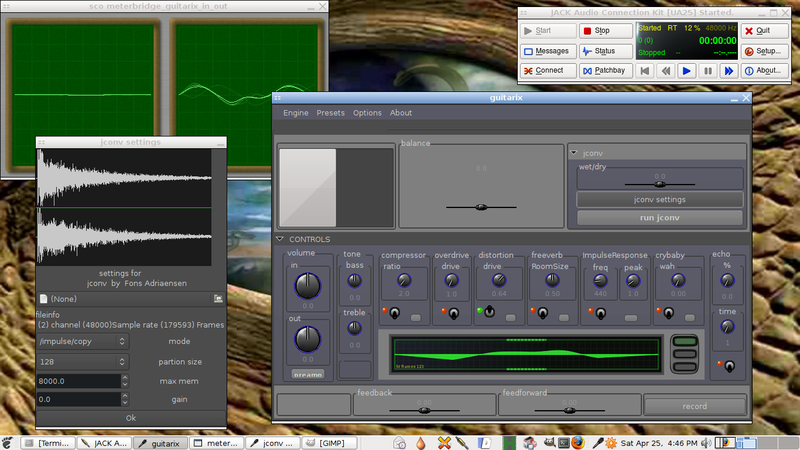 Enter Robin's aics, the Ardour image compositor socket. In lieu of a full explanation, I'll simply tell you that aics provides that timeline (Figure 5). Direct editing of the video within Ardour is not yet possible, but it's clear that that is the direction and goal. The aics software is still in its infancy, so don't expect a polished package yet. The Hydrogen developers have announced the release of version 0.9.4rc1 (Figure 6) of their premier drum machine/rhythm composer for Linux. This version is a release candidate, and the developers want feedback from users, as much as possible. The rc1 status indicates that a full release is imminent, so help the crew find and fix the remaining bugs in this most excellent Linux audio software. Inspired by a topic heading at KVRaudio, I checked up on the latest news from the Bristol site on SourceForge. 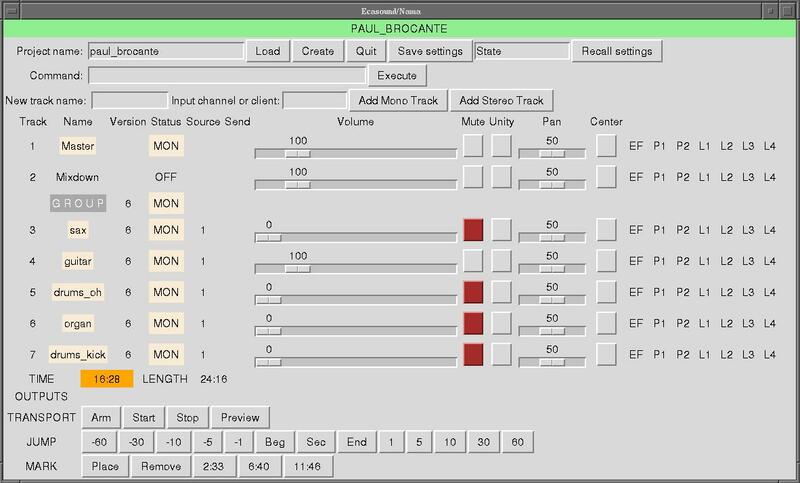 Bristol (Figure 7) is developer Nick Copeland's ongoing project to provide Linux musicians with a high-quality emulator of classic synthesizers. The current list of emulations include a variety of synths manufactured originally by Korg, Roland, Yamaha, Moog, Arp, Sequential Circuits and other companies associated with the Golden Age of hardware synthesizers. In addition to those goodies, Nick has thrown in emulators for Hammond and Vox organs, along with a general-purpose virtual mixing desk. The news page on its home site indicates that Bristol will soon expand its collection of softsynths with emulators for the Korg MS20 and the EMS Synthi A. Speaking of KVRaudio, I've placed a few pieces in the site's neat Music Cafe, a posting space for composers and songwriters to announce their recordings. The Music Cafe is open to all kinds of music, produced with any combination of hardware and software, and I've heard some wonderful things there. I also was happy to discover that I'm not the only Linux-based contributor to the Cafe (greetings to folderol and Count Fuzzball! ), although platforms don't seem to matter too much in the music discussions. And, in case you're wondering, KVR specializes in news and reports about audio/MIDI software, especially audio/MIDI plugins. The site offers an impressive amount of useful platform-neutral information and some great discussion forums, although I suspect its greatest draw is its excellent (and huge) database of plugins. The database lists items commercial, noncommercial and otherwise, including LADSPA, DSSI and VST plugins in native Linux format (for example, Discovery.so). Marije Baalman's work has focused primarily on wavefield synthesis, extensions to the SuperCollider3 audio synthesis and processing environment, and software for working with sensor input. 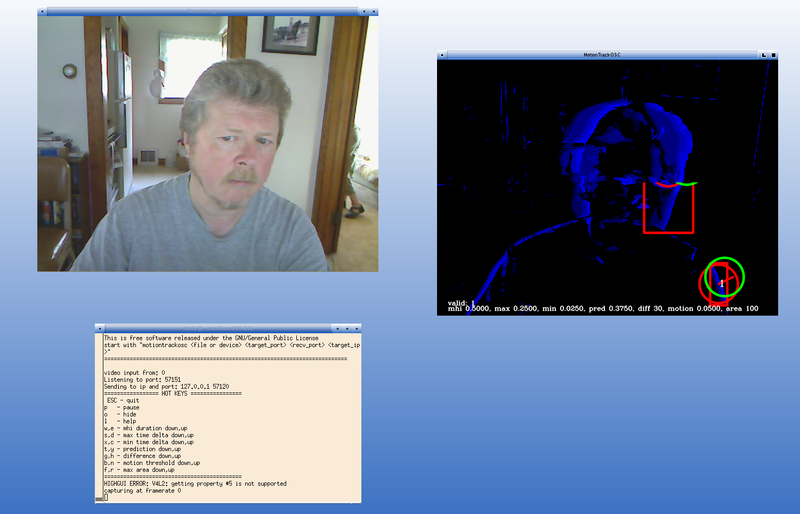 Recently, she has developed MotionTrackOSC (Figure 8), a program that tracks movement from a camera's real-time input or from a video file and converts that data to OSC messages. I haven't done much with it yet, but I plan to set up a system in which MotionTrackOSC will translate t'ai chi movements into real-time control messages for the audio and graphics parameters in AVSynthesis. Ardour does OSC too, as I read in the article Controlling Ardour with SuperCollider via Open Sound Control (OSC), an excellent summary published on the SuperCollider site. The experimentalist in me is eager to start playing with the system described in that article, and I can imagine using it for some interesting algorithmic control over Ardour's mixer. And, by the way, have I mentioned that Ardour 2.8 is now available? See the Ardour home pages for details and download. Kai Vehmanen has added preliminary OSC support to the latest release of his wonderful ecasound DAW. In point of fact, ecasound needs a review here soon. The project has continued to evolve as the command-line DAW for Linux, but some excellent GUIs have been created for it, such as Joel Roth's Perl/Tk-based Nama (Figure 9) and Felix Le Blanc's EMi (Ecasound Mastering interface) (Figure 10). I'm happy to report that Linux softsynths have been used on a commercial pop/rock CD called Lawler Rules. I did some studio work for them over the last year, and the CD is finally out. They produced it on a Mac with ProTools. I played keyboards on it and used exclusively Linux and Linux softsynths. I used AMS for the Moog and ZynAddSubFX for the synthy-string pad on Cocaine Cowboys, and PHASEX for the ARP-y plinks on Death. AZR3 is Hammond organ and Fluidsynth for piano on most of the songs, and Fluidsynth is also the bass on Big Groove. If you like commercial classic rock, enjoy. Check out the song samples on the MySpace page. It's definitely a classic rock groove, and Ken's playing is fine as always. And, be sure to check out the music at restivo.org, if you can't get enough Ken. That's the wrap for this week. I hope you've enjoyed the report, and I hope you've been inspired to try some of the software yourself. I'll be back soon with a HOWTO focused on building Linux audio software, but in the meanwhile, I'm interested in what topics my readers would like to see covered here. Add your suggestions to the Comments section, and I'll be happy to consider any requests (although, of course, I can't promise I'll get to all of them). So, until next time, stay well-intoned, rhythmically accurate and passionately expressive.